Bel Air Truck Accident Injury Lawyer - Over Three Decades of Personal Injury Experience You Can Trust! Are You Looking for a Truck Accident Injury or Wrongful Death Lawyer in Bel Air, California? When a commercial truck or a big rig truck is involved in an accident, the results can be extremely horrific. Every year, the United States witnesses thousands of car-truck collisions that are often the result of fatigue and inexperience on the part of the truck driver or faulty equipment and machinery. If you or your loved one has been involved in a truck accident in Bel Air or anywhere in Los Angeles, or if you have a wrongful death claim due to death of a family member in Bel Air, Los Angeles or anywhere in California, you need to contact an experienced truck accident injury lawyer as soon as possible. In fatal crashes in 2010, the highest percentage of drunk drivers was for drivers ages 21 to 24 (34 percent), followed by ages 25 to 34 (30 percent) and 35 to 44 (25 percent). The speed of alcohol absorption affects the rate at which one becomes drunk. Unlike foods, alcohol does not have to be slowly digested. As a person drinks faster than the alcohol can be eliminated, the drug accumulates in the body, resulting in higher and higher levels of alcohol in the blood. Our experienced accident lawyers are proficient in personal injury claims, truck accident injury claims, car accident injury claims and wrongful death claims. We help the victims pursue their rights to obtain the maximum compensation for their injuries, as well as for their other damages and losses. Please visit our Truck Injury Accident Web Site to learn more about the truck accident injury claim process or you can also call us now at 1.866 INJURY 2 or email us at info@WalchLaw.com or click here for a FREE case evaluation about your specific truck accident or any other personal injury claim. About Bel Air, Los Angeles, Calif.
Bel Air is a very affluent and beautiful neighborhood in Westside Los Angeles, California. As per the 2010 US Census, Bel Air had a population of just 10,135. Bel Air is located about 12 miles (19 km) west of Downtown Los Angeles. It lies across Sunset Boulevard on the northern edge of the University of California at Los Angeles (UCLA), where the senior member of our personal injury law firm attended its school of law. Bel Air is or has been the residence to a number of famous people, including Hollywood actor Jennifer Aniston, film director Alfred Hitchcock, singer-songwriter Joni Mitchell and many others. Loads that are improperly loaded so they shift weight causing unsafe balance, etc. Our experienced team of truck accident personal injury lawyers possess tremendous experience in resolving personal injuries and wrongful death cases in Bel Air, Los Angeles, Westwood, Beverly Hills, Santa Monica, the San Fernando Valley, Ventura and throughout California. Please call us at 1-866-INJURY 2 or 866-465-8792 or 818-222-3400 (after hours, press 1) for a FREE, no-obligation consultation. You can also email us at info@WalchLaw.com, or fill out our contact us form to find out about your options, including medical care and settlement. 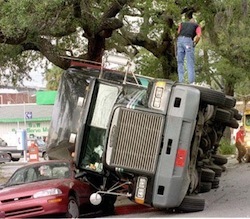 Our truck accident personal injury lawyers offer: FREE Consultation and NO Fee Until You WIN!